Greenpeace has put the spotlight on the lack of fish labeling laws in Australia in its latest campaign, ‘Label My Fish’. Greenpeace wants to put pressure on the Australian government to implement labeling laws that bring attention to overfishing, slave labour and mercury poisoning from imported fish. Australians consume 370,000 tonnes of seafood a year, with almost 72% of this seafood being imported. Over the Easter weekend alone, Australians were expected to purchase $25 million worth of seafood and fish. 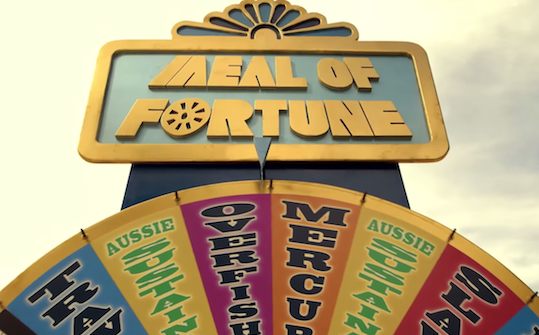 The video stars SBS’s What’s The Catch host, Matthew Evans, as a games show presenter who invites passersby on a Sydney beach to spin the ‘Meal of Fortune’ wheel. The wheel aims to highlight Australians’ lack of awareness about what they are eating, how it’s caught and where it’s from. The next phase of the campaign is to set up the wheel outside parliament in Canberra and invite politicians to take a spin. The video also promotes the Australian sustainable fishing industry, and asks viewers to sign its online petition for fish labelling reform. The petition currently has over 37,000 signatures. The European Union introduced new fish labelling laws in December last year, joining the US and the UK who already have similar laws in place. In Australia, the Northern Territory is the only state or territory that requires seafood in the food sector service to identify whether its seafood is sourced locally or overseas. The ‘Label My Fish’ campaign comes off the heels of a recent Thai tuna scare in Sydney last month, where a woman was feared to have histamine fish poisoning from canned tuna sourced overseas. “The problem of Australia’s appalling seafood labelling is a fundamental one that really has to be solved if we want to have abundant, sustainable seafood available to us in the future,” said Nathaniel Pelle, oceans campaigner at Greenpeace Australia Pacific. DDB Group Asia Pacific regional director Andy Fackrell launched the regional initiative and called on advertisers to be “more vocal in environmental issues”.